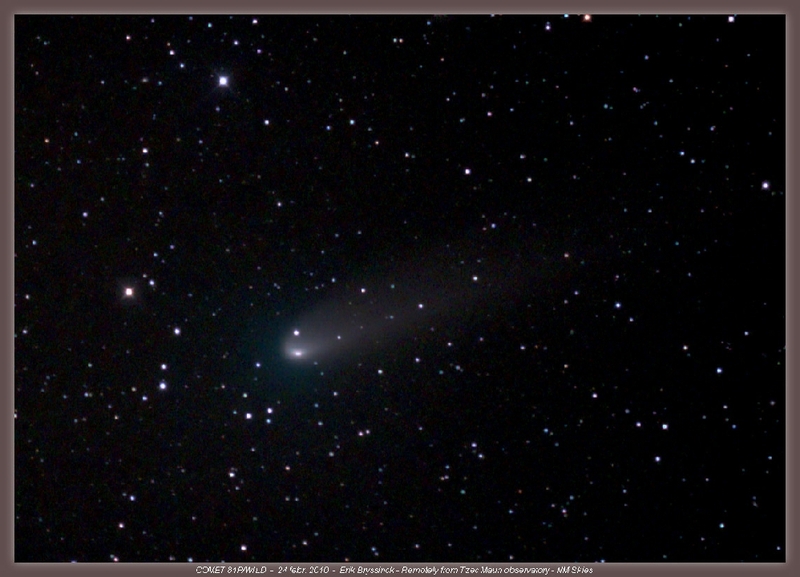 Don Machholz has found his 11th comet! The famous - and totally visual! 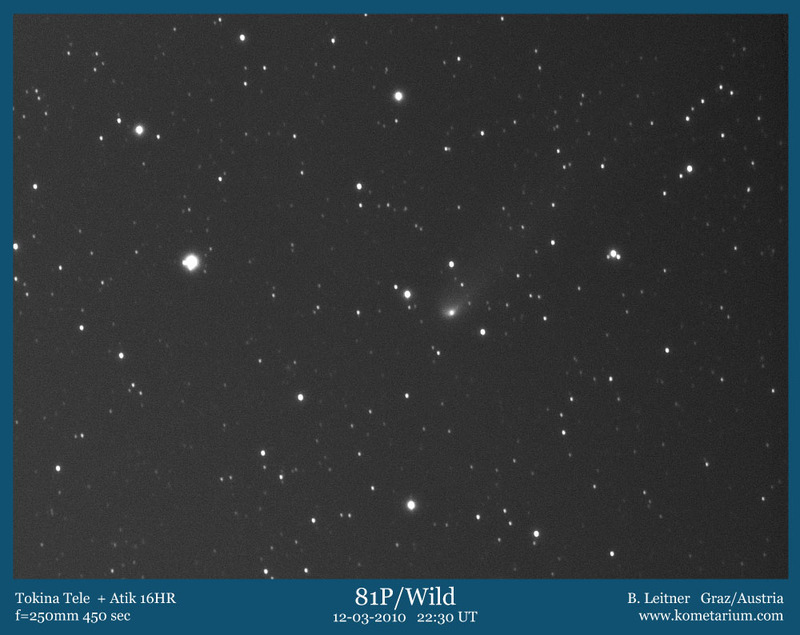 - comet hunter has done it again: On March 23 Don Machholz hit on what would become comet C/2010 F4 (Machholz) while sweeping the sky with a 47-cm reflector at x77 from Colfax in California. The the 11-mag. object didn't move in the remaining less than 20 minutes before morning twilight got too strong, though, and Machholz had to wait a full three days before he could see it again and claim his first find after 607 hours of searching since the last discovery in 2004. So far the orbit isn't known well; the comet seems to be heading towards the Sun with shrinking elongation but constant magnitude from Earth, with a 1/2 AU perihelion in early April. Here are a picture from March 27 and another one. 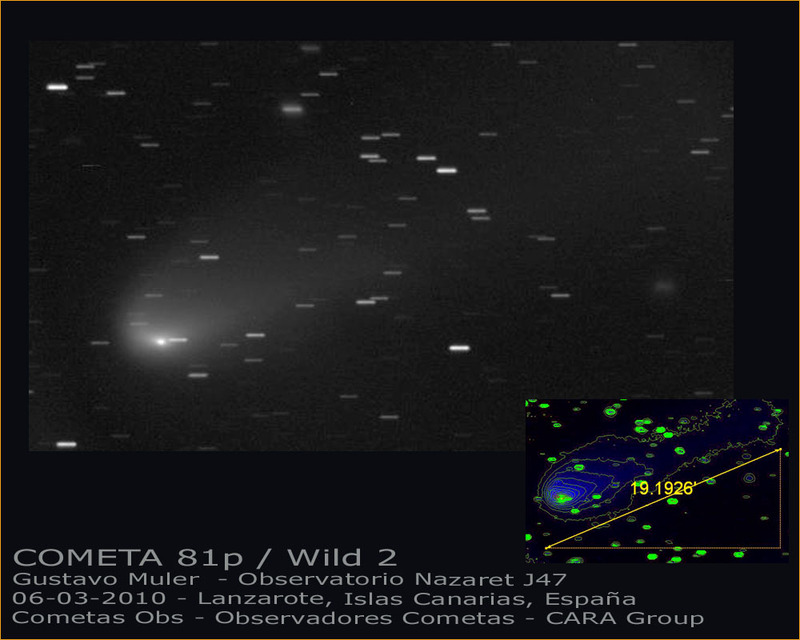 • More nice comet pictures: broken Siding Spring (a video interview with the split's discoverer) on March 23 (wide-field) and March 22 (close-up), 81P/Wild in the night March 23/24 - and great image collections of past comet beauties by Michael Jäger and Ronaldo Ligustri. • Also a meteor caught on camera over Alabama (more, more), a meteor tv clip from Philadelphia, a space image of a possible big impact crater in the D.R.Congo, the outcome of the TAOS Kuiper Belt search via stellar occultations and the small object discoveries by WISE (which NASA reported wrongly first). In other news Mars can still be fun as pictures from March 23, March 22, March 19 and March 11 show, but the planet is shrinking rapidly and is now smaller than 10" again. • An early picture of Mercury & Venus of March 27, now that the joint evening show of both planets has begun. And there can be something seen on Mercury with effort ... • Finally a nice bipolar sunspot on March 27 and a great ISS/sunspot conjunction with the same group (AR 1057) two days earlier! The star V407 Cygni was previously classified as a symbiotic star, a binary star system in which a red giant transfers mass to a white dwarf companion. Occasionally, the material on the white dwarf becomes hot enough that it begins to undergo nuclear fusion, and the system goes into outburst. A similar process occurs in classical novae, but in the symbiotic stars these outbursts are less intense and a more steady process while in classical novae the thermonuclear ignition is explosive - and on March 10 V 407 Cyg actually underwent what appears to be just such a classical nova explosion! Furthermore the star is now also suspected of being a gamma ray transient, something never observed in a symbiotic system. Observations are encouraged; articles and updates are here (alt. ), here, here (earlier), here, hier and here. • Also news about the variables GW Lib and GK Per. 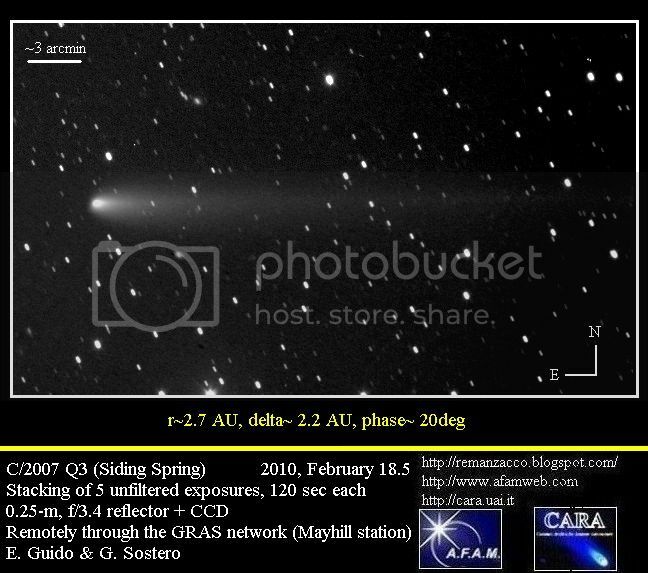 The nucleus of comet C/2007 Q3 (Siding Spring) has split, though the fragment in the coma requires larger instruments to see: Stories of March 22, March 19, March 17 and March 9, several pictures and selected ones of March 14, March 19, March 20, March 21 and March 22 (zoom, more zoom). • Also 29P in outburst on March 18, 81P/Wild with nice tail & coma details on March 6, March 8, March 12, March 19 and March 21 - and the dusty streak of C/2010 A2 was still there on March 4, March 7 and March 11. 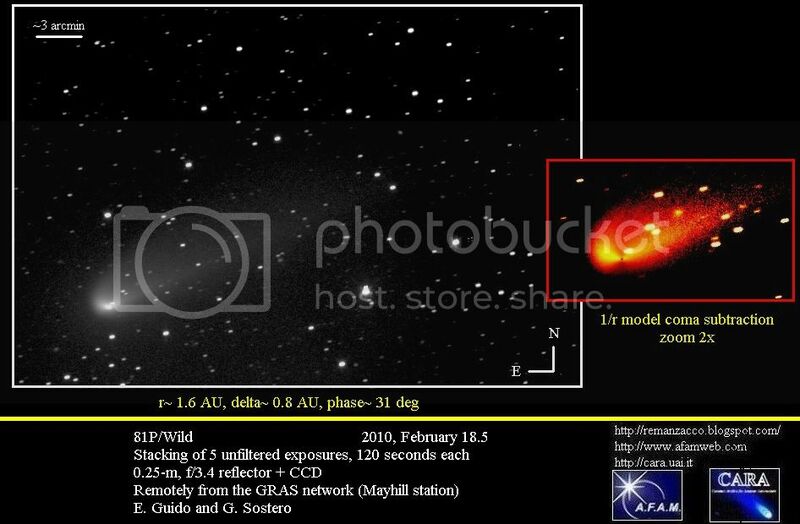 • The discoveries of P/2001 Q11 after 9 years, C/2010 E5 (Scotti), C/2010 E1 & E2 (the latter involving D. Levy). • 30P met 31P on March 4, Rosetta target comet 67P is still visible for experts (but then gone til he encounter), and several Kreutz comets fell into the Sun in mid-March (mehr, mehr). • Also a bolide in Hungary and speculation about an impact crater in the D.R.Congo. In other news there was a big sunspot group in mid-March, the understanding of the solar cycle may advance (more, more), while the Sun may now return to normal activity levels after a Grand Maximum lasting the past 60-70 years. • Mars pics of March 19 (more, more), March 11 (1 to 11), March 8, March 7 (more), March 6, March 4 (more) and March 1 (more). • Jupiter's GRS in thermal IR (more, more, more and mehr), several Titan transits in 2009/10 and Saturn in opposition (earlier). • Venus & the lunar crescent on March 17 and March 16 and the Moon on the 16th from the ISS; also a movie of the ISS in hi-res and an ISS Sun transit. • A Messier Marathon report from India and another one, a new public observatory and an article (PDF) on remote observing and how it helps amateurs hunt exoplanets. While the rare Saturn ring plane crossings took place already last year, there is an almost-crossing coming up in June when the rings will be less than an arc second wide (as can be checked with this calculator). Currently they are twice as wide and very obvious in any telescope, which they better be as this month Saturn is in opposition to the Sun on March 22nd - the sky highlight of this month (see also here, here, hier, hier, hier und hier). Also the visibility of Venus at dusk improves a bit throughout the month (with the Moon nearby on the 16th - hard! - and 17th), and in late March the best evening visibility of Mercury for the year should begin - during the interval March 27 ... April 4 the elusive planet may be easiest to spot. 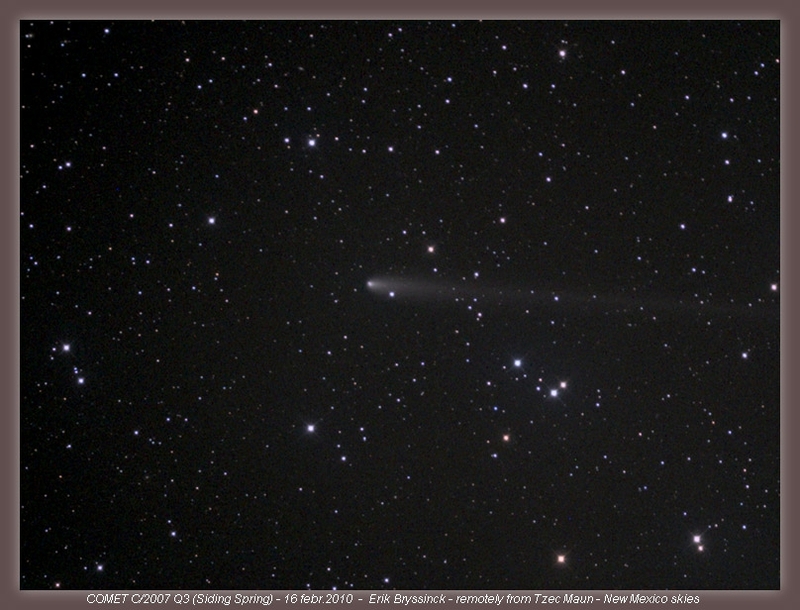 Meanwhile it's not to early to dream of comet 103P/Hartley (2), well visible in the fall. And already in summer 10P/Tempel could be nice. In solar news there has been much talk (like here, here, here, here, here, here and here) about the "Solar Storm Watch" where everyone is invited to track coronal mass ejections via the HI instruments on the STEREO spacecraft - let's see how this crowdsourcing for space weather alerts works out. Meanwhile you can turn to the Community Coordinated Modeling Center of the Space Weather Laboratory at NASA's Goddard Space Flight Center. • Some solar action on Feb. 7 and in Feb. and earlier, Feb. 15 aurorae and more on the non-effect of the Sun on climate matters. • A new type of variable stars has been discovered, a new Nova Sco, we have a precovery of KT Eri, insights into Eps Aur here, here and here and Swift observations of U Sco. 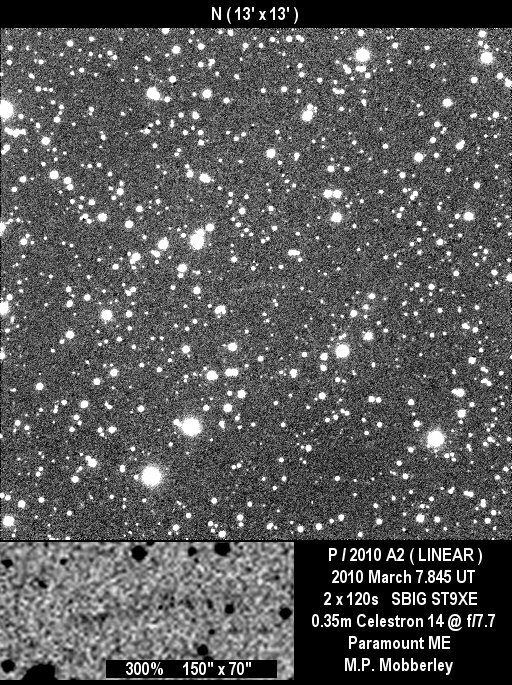 In the solar system we had a 3rd outburst of comet 29P, nice pics of 81P on Feb. 24, Feb. 22, Feb. 18 and Feb. 17 (more), 2007 Q3 on Feb. 18 and Feb. 16 plus a January WISE picture - and yet another model for Holmes' weird outburst in 2007. • A fireball in Hungary, craters in Antarctica and the Arctic, dark NEOs and a lightcurve of NEO 2009 UN3. • Asteroid Vesta in opposition (advertised here, here an here) was well observed: a movie on Feb. 18 and a passage between two stars on Feb. 16 (more, mehr, mehr, earlier, still earlier). • Of Mars in the month after opposition nice pictures of March 4, March 1 (more, more and more), Feb. 24 (also in blue), Feb. 23, Feb. 20/21 (Feb. 21, Feb. 20), Feb. 17 (more), Feb. 16 and Feb. 1. • With Venus just back at dusk, a conjunction w/Jupiter has been observed on Feb. 16 in the U.S. and Germany; the lunar crescent was way above the tough planet pair. In other news a video of a grazing occultation of a Pleiades star by the Moon in Greece (the appulse from Germany), the Moon imaged from the ISS, also in hi-res (more) and just rising - too bad the photographer is coming back in June. Also polar clouds from Space in January (more), bright sundogs seen on March 4 from Germany and elsewhere: a coincidence or particular atmospheric conditions, widespread? One could ask the AKM which even runs meetings on halo phenomena! • A stolen telescope in Texas is back (more), an interview w/Ashcroft, a review of robotic astronomy, and amateur astronomy Decadal Survey, one guy's story, pop astro at ASU, various citizen science projects ... and a crazy WWT/Earth mapping blend.